DIY (Do It Yourself) Awnings was created for homeowners who are handy and are looking to save money – big money. 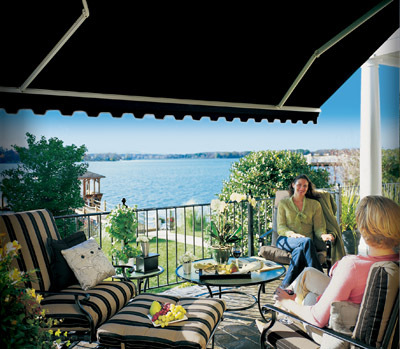 We know retractable awnings and have a quarter century of awning manufacturing experience. Our team of skilled craftsmen will produce a custom-made, long lasting shading system that will provide years of trouble free solar protection. We use the finest materials available from North America and Europe. We do not import any materials from China, which is very common in this on-line awning market. You know the old adage, “You get what you pay for” and retractable awnings are no different. We have seen some of the low cost retractable shading products offered on-line with most coming out of China Practices, such as, the hand cutting of fabrics, non-computerized sewing, cheap poly thread, burnt fabric edges, polyester fabrics, wet painted awning frames and non stainless hardware are common; you would never know that this is what you are purchasing by simply looking at a picture. Be sure to view our educational link 17 things to ask before purchasing a self installed retractable awning.